Using Active Technologies for PDF provides the ability to include interactive Flash-based reports, dashboards, and animations in PDF documents. An active report for PDF is available in Report Painter in the Developer Studio environment and from WebFOCUS InfoAssist in the Managed Reporting environment. You can also create active dashboards for PDF from Document Composer in Developer Studio and from InfoAssist. SWF files that are Adobe Flash Player compatible combine vector graphics with animation effects that are scalable and provide perfectly smooth transition of lines and images, creating the highest quality, outward-facing PDF documents with engaging functionality, and better visualization of data. Adobe Reader 10.1.9 or higher is required so that the Flash run-time code included in the Adobe client can render the Flash content. For details on enabling Adobe Reader for browsers such as Google Chrome and Safari on Mac OS, see Viewing an Active Technologies Report for PDF in Adobe Reader. The following image shows Document Composer with active PDF selected as the Output format for a Compound document, and the active dashboard for PDF. The active report for PDF is available from Report Painter and Document Composer in Developer Studio, and from WebFOCUS InfoAssist in Managed Reporting. An active dashboard for PDF is available in Document Composer and can be generated using COMPOUND HOLD/PCHOLD FORMAT APDF syntax. For more information about active dashboards, see Creating Active Technologies Dashboards in Document Composer. An active report for PDF is available in Managed Reporting InfoAssist and can be generated using HOLD/PCHOLD FORMAT APDF syntax. For more information about InfoAssist, see the WebFOCUS InfoAssist User's Manual. Select active report for PDF (APDF) in Report Painter. In Report Painter, select Output from the Report menu. The Report Options dialog box opens at the Output tab. From the Select Format drop-down list, choose active report for PDF (APDF) as the output format for the report. Tip: The Features and Format tabs show the options that are available for the active report for PDF. You can also select active report for PDF (APDF) from the Output Format toolbar. Select active PDF in Document Composer. Create a new report with Document Composer. Select active PDF from the Output format properties field. A coordinated compound layout coordinates all reports and graphs from the document with a common sort field. The coordinated report is burst into separate page layouts at run time, where each value for the first sort field displays on a separate page. 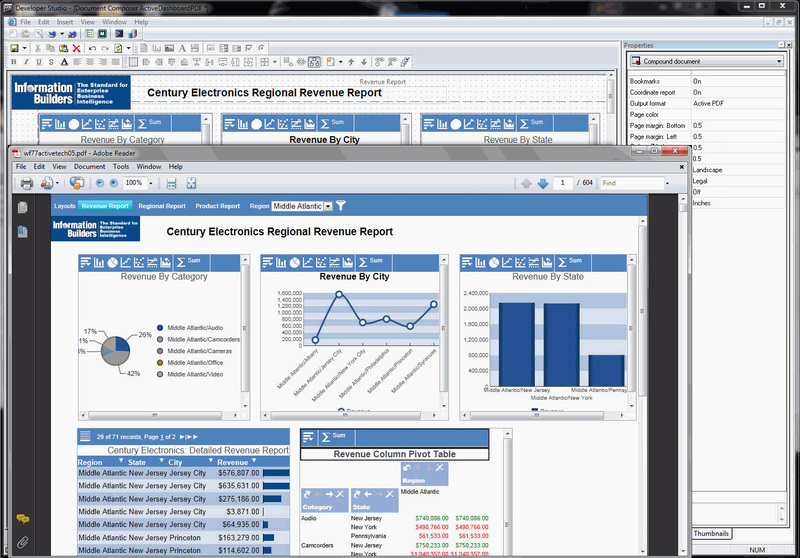 Add multiple active reports to create the active dashboard. Position the reports in the document. Repeat these steps to embed multiple active reports into the coordinated compound document that will create the active dashboard. Select active PDF in WebFOCUS InfoAssist. Create a new report or a new document with WebFOCUS InfoAssist. Select active PDF from the Format tab of InfoAssist. The report loads the active report for PDF. Tip: For information about the available WebFOCUS syntax formatting options for active PDF reports, see Active Technologies for PDF Formatting Options. If you are using Active Technologies for PDF, you can use the following WebFOCUS syntax to format the width and height, background color, and scale options for the active PDF report. Is the width of the SWF application in pixels, such as 1024 or 800. Is the height of the SWF application in pixels such as 768 or 600. Is a hex value or color name such as #aebae4 or NAVY. The default color is white if the value string is empty. You can change the font type for active report menus when using active reports and active dashboards for PDF output formats. By default, the font type information is stored in the irpcfg.js file, located in the WebFOCUS Reporting Server \home\etc directory. The .arMenu section of the irpcfg.js file enables you to modify the font type and size for the active report menu items in the report output. The style section for active reports and dashboards for PDF formats has been moved from the irpfsty.js file to the irpcfg.js file in the \home\etc directory of the WebFOCUS Reporting Server, starting with Release 7.7 Version 04. The style section for active reports and dashboards for PDF format in the irpcfg.js file shares the same style section as active reports and dashboards for Adobe Flash Player. Here is a summary of the steps that you follow. Search for irp*.js files in your ibi\apps folder. Rename the files. Do not delete them, as you need the customized style section from these files. In your application folder, create a new, empty text file. Name it irpcfgu.js for active reports and dashboards for PDF. In your application folder, create a new, empty text file, and name it irpcfgu.js. Copy the styling section of the irpcfg.js file from the WebFOCUS Reporting Server location (\home\etc directory), and paste it into the irpcfgu.js file in your application folder. This should be the same directory in which the active report or active dashboard resides. For example, from the Projects on localhost area in Developer Studio, create the irpcfgu.js file in the Other subfolder of the project folder. Sets the font size of the active report menu. Sets the font type of the active report menu to bold. Sets the font family of the active report menu. Currently, Adobe Flash Player supports the Arial, Times, and Courier font types. For details about supported font types, see the Adobe documentation. Sets the font type of the active report menu to italic. The following image shows the active report for Adobe Flash Player output with the Courier font type for the active report menus. This topic describes how to enable Adobe Reader for Google Chrome, Mozilla Firefox, and Safari on Mac OS so that you can view active reports for PDF (APDF output format) in those browsers. By default, the Chrome browser uses a built-in PDF viewer to open a PDF. This viewer is not compatible with the PDF functionality of Active Technologies. When you generate an active report for PDF, active chart for PDF, or active dashboard for PDF, Active Technologies embeds Flash SWF files. These files are not supported by the Chrome PDF Viewer. As a result, if you are using Chrome as your primary browser, an active report for PDF, active chart for PDF, or active dashboard for PDF will not be displayed correctly unless you disable the default Chrome PDF Viewer and set Chrome to display PDFs using Adobe Reader. 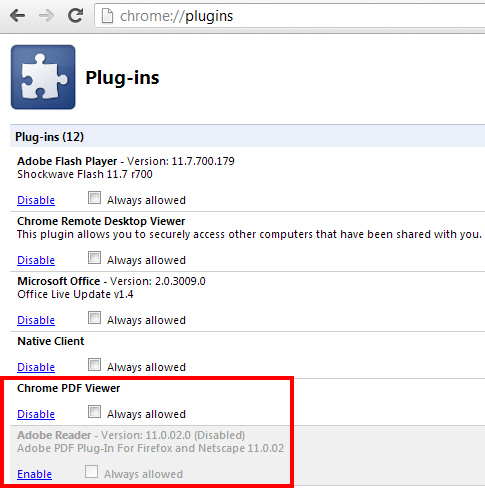 Use the steps in the following procedure to disable the Chrome PDF Viewer and enable Adobe Reader. Note: You may be prompted by a message in the browser to open a PDF using Adobe Reader. You can choose that option rather than use the following procedure to enable Adobe Reader. On the Plug-ins page in the Chrome browser, locate the entry for Chrome PDF Viewer and click Disable, as shown in the following image. Locate the entry for Adobe Reader and click Enable. On the Plug-ins page, click the left arrow to go back to the Chrome home page. Open the active report for PDF, active chart for PDF, or active dashboard for PDF in the Chrome browser. For example, you can copy the URL of an active report for PDF that you ran in Developer Studio and paste it in the Chrome address bar. The PDF will open in Adobe Reader. For details on using Chrome, press the F1 key to access Chrome online Help. To view active reports for PDF (APDF output format) using Mozilla Firefox, you must disable the Firefox built-in PDF viewer and enable Adobe Reader. On the Mozilla Firefox Start Page, click the Firefox button at the top left, and select Options. On the Options dialog box, click the Applications panel. Scroll down the Content Type list on the left, and locate and click Portable Document Format (PDF). 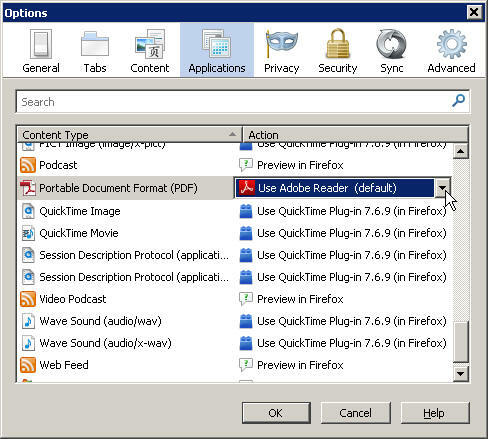 On the right, in the Action drop-down list for Portable Document Format (PDF), click the drop-down arrow, and click Use Adobe Reader (default), as shown in the following image. Click OK when you are done. By default, your active reports for PDF will now open in Adobe Reader. For more information on using Firefox, click the Firefox button and select Help. If you are using Safari on Mac OS, you must install Adobe Reader to view active reports for PDF (APDF output format). If you do not install Adobe Reader, Safari displays PDF files using the Mac OS native PDF support. Much of the Adobe PDF functionality is not fully available in the Mac OS native PDF support. For details on system requirements and configuration of Acrobat to display PDF files in Safari, go to http://helpx.adobe.com/acrobat/kb/troubleshoot-safari-plug-acrobat-x.html. The following apply when you use active reports for PDF. The menu in an Active Technologies report for PDF always opens on the right side of the screen, instead of dynamically switching to the left side when there is not enough width on the right. The positioning of the menu is the result of a known issue in the Adobe Flex SDK. As a work-around, a horizontal scroll bar is added at the bottom of an Active Technologies report in APDF format so that you can access the menu in the rightmost column. In order to execute drill downs with the APDF output format even when the report is in disconnected mode, you must specify a fully qualified FOCEXURL in the environment. Is the web server host name that end users enter in the browser to access WebFOCUS. Is the HTTP port number of the web server that end users use to access WebFOCUS. When using Flex to create SWF files that play on the PDF page, you must set the scaleMode to StageScaleMode.EXACT_FIT. This enables Adobe Reader to scale the content when you zoom in and out on the page. It also allows you to print the PDF with the SWF scaled properly. Active Technologies for PDF automatically sets this property. However, when the scaleMode is set to EXACT_FIT, image distortion may occur. 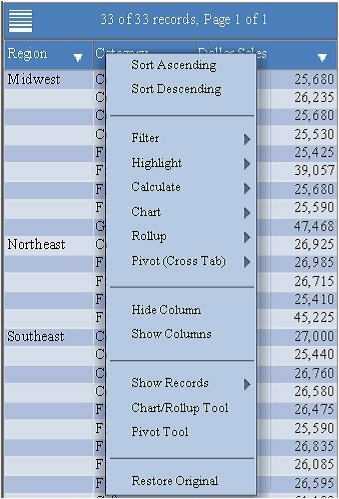 A Pivot table is not fully supported by the Active Technologies output format APDF. Active PDF (APDF) format is not supported with the Microsoft Edge browser, since APDF requires the Adobe Reader plug-in that supports Flash Player, and that plug-in is not available with the Microsoft Edge browser.